Bristol and Avon Group specialize in the removal and disposal of waste material from a wide variety of sites within the South West region. 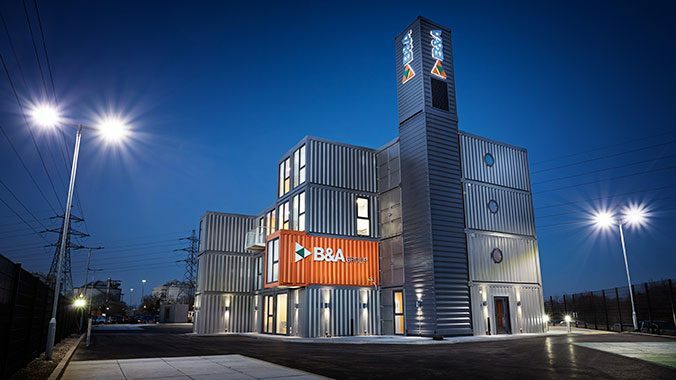 This eco-friendly state of the art building is the new B&A headquarters, constructed from new & used shipping containers with a magnificient architectural tower feature that overlooks the M49. 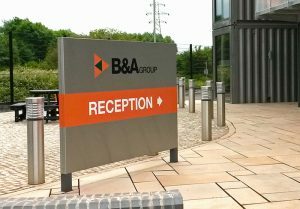 B&A Group approached Capitol as their chosen Bristol Sign supplier to design, manufacture, install and project manage all of their sign requirements throughout the entire development project. It was decided to utilise the feature tower as the main focal point for signage. To achieve maximum wow effect we designed & manufactured mirror polished stainless steel 3D lettering and logos in B&A corporate colours, all being lit from behind to achieve a halo lighting effect on all three sides of the tower. This concept was carried over the entire development where ground level illuminated stainless steel totem directional signs were employed to assist visitors and staff. The results are truly illuminating!